A fun, fast-moving screwball comedy that takes on not only a classic romance, but also the newspaper industry and a bit of a murder mystery. 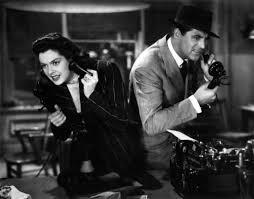 His Girl Friday is a black and white comedy about romance in the newspaper business. Only instead of being the usual kind of romantic comedy, where characters meet, hate each other, and than fall in love, this one is more of a movie about a long con. Editor Walter Burns seems to have it all and be very happy in life until his ex-wife, Hildy shows up. She wants a divorce and arrives with her new fiancé on her arm. This sets Burns off, and he spends the rest of the movie determined to break up Hildy’s relationship with her fiancé, and to win her back. He uses the newspaper reporting business as a way to do it. The movie is smart, fast-paced, and a whole lot of fun. Back in the nineteen forties screwball comedies were the best kinds of movies in town. Actors like Jimmy Stewart, Katherine Hepburn, and Cary Grant, got their starts with these kinds of films (long before Stewart and Grant became the golden boys of Alfered Hitchcock movies.) These were fast-talking, fast-moving witty black and white romantic comedies. Movies like The Shop Around The Corner, The Philadelphia Story, Bringing Up Baby, Adam’s Rib, and Arsenic and Old Lace were the pillars of the genre. These were the movies that replaced the slapstick of Chaplin and Buster Keaton silent movies. With those movies it was fast movement. With these, it was fast talk. His Girl Friday is one of the movies that shows all of this off better than the rest. It’s a movie that takes place for the most part in a small setting with a confined story. This thing could easily be a play, featuring only a handful of characters and taking place mostly in a newsroom. And the fast talking of Cary Grant and Rosalind Russell is on full display here, with the characters sometimes going so fast that you can’t even make out what they’re saying as they talk over each other. Whether you understand every word or not, the rhythm and talent is impressive and quite a lot of fun. The story here involves a man who is more or less the king of the newspaper business and seems to have it all. Except for the woman he loves and desires. Walter Burns, (Grant,) is the man who runs his paper, and everything seems to be going fine for him until his ex-wife, Hildy (Russell,) shows up. She wants a divorce from him so she can marry someone else. Hildy is engaged to a simple-minded, sweet-heart of a gentleman named Bruce Baldwin, (Ralph Bellamy.) She used to write for the newspapers alongside Walter and the two of them were a exciting team, always chasing after every thrilling scoop or story. But now things have settled down for Hildy, and the divorce is the final straw that will help her put all of that fast-paced newspaper lifestyle business behind her. This is a little too much for Walter. Here’s a guy who probably hasn’t given Hildy much thought in years, but now seeing her show up again and seeing that she’s about to marry someone else makes him suddenly insanely jealous. Of course you wouldn’t know it from looking at him, because Walter plays the situation as cool as a cucumber, pretending he is super happy for the couple and wants to do all he can to help them get the divorce and get on their way. This actually couldn’t be further from the truth. Walter will spend pretty much the entire movie trying to sabotage the Hildy – Bruce relationship, by pulling the strings in secrecy, behind the scenes, to cause them all kinds of setbacks, delays, and problems. The actions that Walter takes throughout the movie, such as having Bruce thrown in jail a number of times, on all sorts of ridiculous charges, and even kidnapping Bruce’s mother, at one point, might make you think that Walter is a villain. But remember this is a comedy, and Walter is simply an anti-hero. He’s the fun character who you want to laugh at, and see what he does next. His agenda is clear, he wants to keep Hildy there and to win her back. But seeing the way he gets to this spot is a whole lot of fun. When Hildy shows up speaking about the divorce, Walter is unhappy. When she says she’s moving to Albany to leave the newspaper business behind, it takes things to a whole other level. Walter’s jealousy works on two fronts. One is the romantic angle, but the other is that Hildy is getting out of the business. By turning her back on that, it’s like she’s turning her back on him, saying that she’s better than him and better than all the fun they’ve had together in the past. To him, working in this business is the greatest thrill there is, and he wants to prove to Hildy that she still needs it. That it’s in her blood. And so Walter gets Hildy to write a story. She protests for as long as she can, but circumstances just keep working out so that she is in the right place at the right time, to catch the latest scoop. This scoop involves a man who is being accused of shooting a police officer and has now escaped from prison. Hildy keeps getting tips about this man and Walter wants her to write about them. Eventually she agrees, under the condition that Walter buy a huge insurance policy from Bruce. And he does. Using fake money. He then proceeds to have Bruce picked up and thrown in jail. What helps with keeping Hildy there, working hard at the story, is the fact that the escaped prisoner, and accused murderer turns up right in her lap. As it happens, the man is hiding in a place where Hildy not only finds him, but has to help him keep out of sight in order to get her story. Meanwhile, Bruce keeps showing up, trying to finalize whatever they need with Walter and drag his wife away. And Hildy is so linked in and driven by the story she is writing, that she more or less ignores Bruce, as if she doesn’t even realize that he’s in the room. And Walter doesn’t help. From the very first moment he meets Bruce, he’s ignoring the guy, (pretending that Hildy is actually marrying an old man, and introducing himself to the old man, instead of to Bruce, who is standing right beside him,) and trying to make Hildy realize how forgettable her fiancé is. The final act of the movie becomes a little more about the political scandal and coverup going on in the town than it does about the relationship between Walter and Hildy. In that department it does cool off and lose some steam. We need Walter to not be held responsible for some of the terrible things he’s done, such as kidnapping an old woman, and so in order to get out of them, he has to make a deal with the mayor and sheriff, who have their own evil agenda. They want the man accused of murder to be executed because of what it will do for their political career, whether he is truly guilty or not. The whole thing is a little much. Especially when we’ve got so much excitement and electricity going on with our love triangle and three leads. His Girl Friday is a movie that takes changes and pulls no punches. This might be the first time that a romantic comedy or love triangle film was so directly about the deconstruction of a relationship, in order to build another, more devious one. Our protagonist here is incredibly selfish, and doesn’t even attempt to hide it. Other movies have taken a note from this one, and taken the story in different directions since then, from Casablanca (where the hero is more noble,) to My Best Friend’s Wedding, (where the romance storyline has a very different, and more consequential ending.) 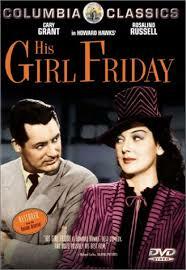 But His Girl Friday was the movie that went for the jugular and never held back. There was nothing politically correct or decent about Walter’s actions, and the fact that the movie was willing to let him get away with them, was kind of inspiring.